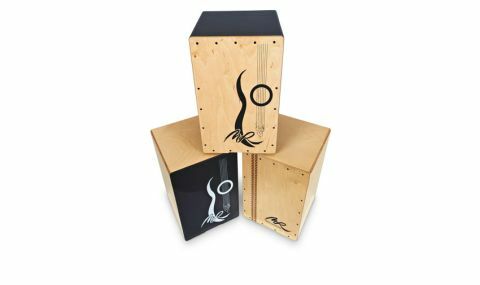 With just a little flair for rhythm, almost anyone can sit on this cajon and begin to have some percussive fun - and the price isn't bad, either. Great finish and build. Decent, flexible array of sounds. Not the most playable cajon we've encountered. Spanish brand Manuel Rodriguez may be best known for its stunning classic guitars, but the company also produces a line of cajons. Now in their third generation, this family-owned business has been hand-crafting guitars in Toledo near Madrid since 1905. Its reputation is richly deserved, with superb build quality and sound produced from the classically proportioned European acoustic guitars - Eric Clapton, Paco de Lucia, Andre Segovia and Sting are amongst its list of high-profile clients. "It's smoothly finished, with no evidence of any unwanted sharp edges to shred your digits"
The Farruca has a natural finish shell of gabon wood and comes with a birch tapa, stained in black. As with all the models here, this is smoothly finished, with no evidence of any unwanted sharp edges to shred your digits. There are many generic features and similar components between each model, including a sound hole to the rear, Phillips screw fixings for the tapa, small rubber feet found on the base, snare-effect wires and the large guitar graphics on the tapas of the Farruca and Alegria. Inside each model is a label of authenticity - similar to those found when peering in through the sound hole of any Manuel Rodriguez guitar. The printed label has 'Manuel Rodriguez e Hijos' together with handwritten model designation, serial number and date of manufacture - awarding each cajon with an extra touch of class and credence. The Farruca has only two sections of Velcro for the snares which gives it a slightly loose feel and snare sound - this also helps coax just as much tone and resonance. This box is capable of producing a surprising range of drum and percussion-like sounds for almost any genre with little effort.